Views allow you to control which columns are displayed in the Table, so you can jump directly to the data you are interested in. Each View is represented by a tab at the top of the Table. To change the View, click on a different tab and the columns of the Table will update accordingly (note that this may change the sorted order of the Table.) 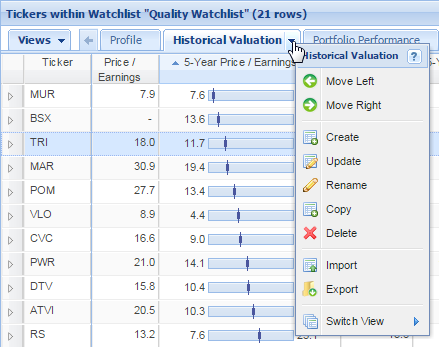 Stock Rover comes with a default set of Views such as Returns, Valuation, and Dividends, but it is also simple to create your own, either by starting from scratch or by modifying an existing View. Use the arrows on either end of the View tabs to scroll to the right or left to see all of the Views. 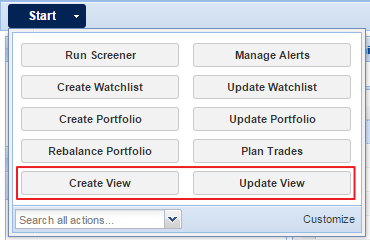 Or, use the ‘Views’ master tab on the left for a drop-down list of all the views, listed alphabetically. If you’d like to see which view a metric is in, search for it with the Add Column button, and any views that contain this metric will be listed after the description. If you click the view name, it will bring you to that view and briefly highlight the metric. 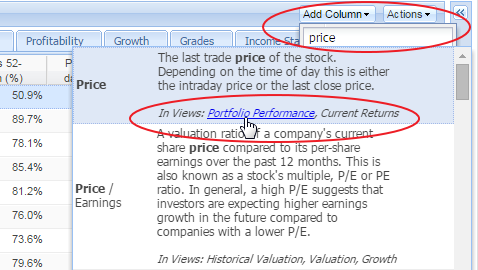 Right-click a View tab to create or import a View, or to modify, rename, copy, delete, export, or move the current View. Use the ‘Switch View’ item to open a different View, which can be faster than scrolling through the Views. 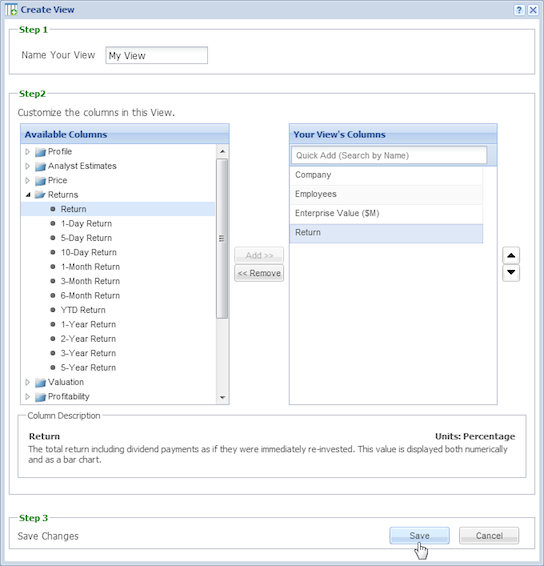 If you choose to create or modify a View, you’ll be brought to the View manager, where you can name your View in Step 1, add or remove columns in Step 2, and then save the View in Step 3. You can also choose to update or a create a view through the Start menu.